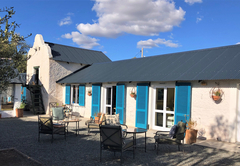 Kuilfontein Stable Cottages is a highly recommended B&B with self catering option, providing accommodation in Colesberg for tourists visiting the Upper Karoo region. 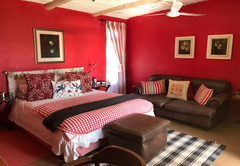 Kuilfontein Stable Cottages offer bed & breakfast or dinner, bed & breakfast accommodation in Colesberg, in the delightful old stable quarters, which have been converted into luxurious guest rooms with style and comfort. Charm, history and convenience. 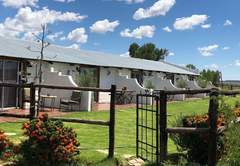 Kuilfontein Stable Cottages is perfectly situated as a stopover for travellers from Gauteng and KwaZulu Natal to the Western Cape, near the N1 and Colesberg. 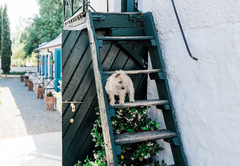 This historic racehorse stud and sheep farm has been in the family since 1876. 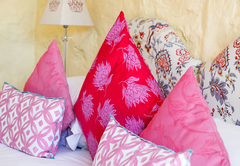 Leigh and Penny Southey and their staff are renowned hosts where guests become dear friends. 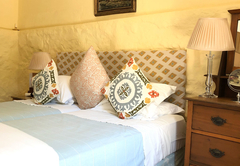 The delightful old stable quarters have been converted with style and comfort. 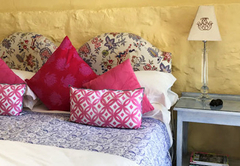 Crisp white cotton percale linen, mohair blankets and feather pillows add luxury to rooms decorated with family antiques and country style. 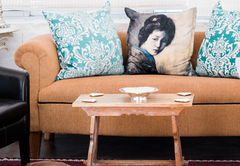 There are two luxury units, one family unit and five standard units. 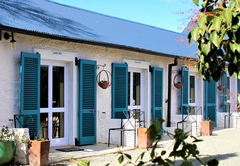 Gourmet food is served on gleaming yellowwood tables in a cosy dining room. 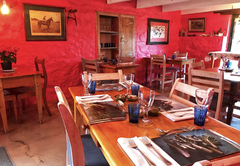 The resident chef uses farm fresh produce including their world-famous succulent Karoo lamb. Vegetarian are catered for with delicious dishes of couscous stuffed peppers and crisp vegetable pastas. 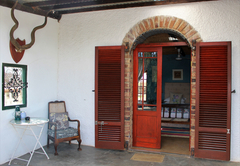 Breakfasts include home-made breads, muffins jams and preserves with fresh fruit and farm butter and cream. 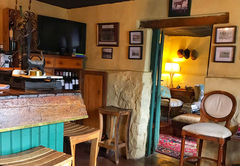 Meet fellow travellers for a pre-dinner drink in the charming pub or watch a magnificent Karoo sunset with a sundowner. 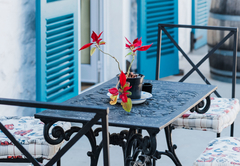 After dinner drinks and coffee are served in a delightful gazebo or under the starry skies. Stroll on the vast estate with good bird watching and plains game viewing. 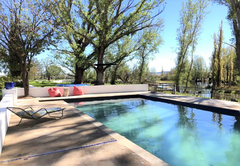 Swim in a fresh spring water pool or play a game of boule. Safe stabling and paddocks provided for overnighting horses. 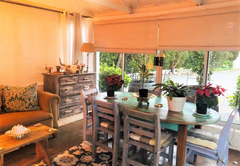 A delightful old stable quarter that has been converted with style and comfort. Crisp white cotton percale linen, mohair blankets and feather pillows add luxury to this Standard Twin Room with en-suite bathroom. 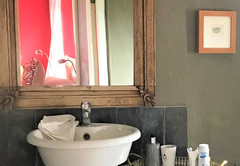 Converted with style and comfort this delightful old stable quarter has a queen sized bed and en-suite bathroom. 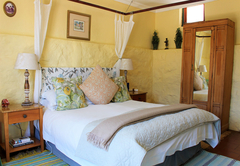 The crisp white cotton percale linen, mohair blankets and feather pillows add to the luxury of the Standard Double Room. 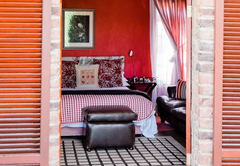 A delightful Family Suite with en-suite bathroom and inter-leading door. 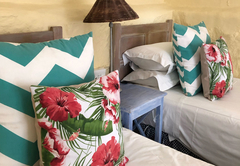 Converted from an old stable quarter the Family Suite has crisp white cotton percale linen, mohair blankets and feather pillows. 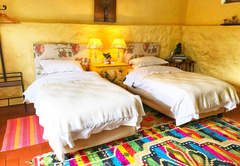 Large luxury room with double bed and en-suite bathroom. 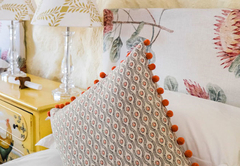 Adding to the luxury of the room, crisp white cotton percale linen, mohair blankets and feather pillows. 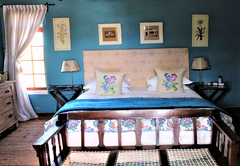 Decorated in a country style with antiques the Large luxury Room has a double bed and en-suite bathroom. 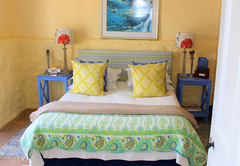 A large family suite with 2 bedrooms, each with en-suite bathroom (bath & shower). There is a large lounge, kitchenette and patio. 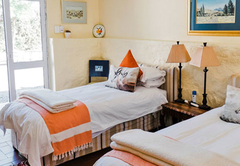 Small self-catering cottage with en-suite bathroom. There is a small lounge and kitchenette. Great hosts, great place. 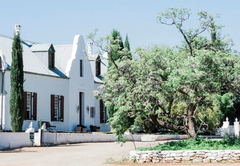 Paradise, pamper stopover in the middle of bone dry Karoo. Staying over on a journey from Cape Town to Jozi was always a pain because of the stop over halfway. This is no longer the case. 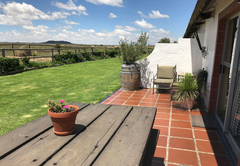 This was our first stay at Kuilfontein and what a nice surprise. Our family room was spacious and well fitted out. 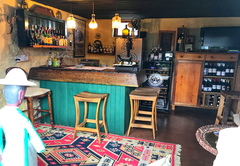 We had a friendly pre-dinner drink in the cosy pub, met some new people and then had a delicious dinner in the charming dining room. It is owner run and Lexi and her staff are great. It's one of those places where you feel that nothing is too much trouble. Breakfast was fresh and delicious, with milk that came straight out of a cow, on the morning you drink it. I highly recommend Kuilfontein and we will definately be back.